Baijiu production is a complicated business. The ingredients and techniques deployed in the process vary from region to region, comprising the subtleties that distinguish one style of baijiu from another. Yet there are production commonalities shared by all Chinese spirits. These five steps are used in the production of all baijiu. But following these steps will only get you so far. You’ll also need the right ingredients and production equipment. What: The baijiu production process begins with a good shvitz. Steaming gelatinizes the grains and breaks down their cellular walls, allowing interaction with the yeasts and other microorganisms found in qu. How: Workers load grains into the pot of a traditional Chinese still. The device is a large rounded container with a slotted base. In function it acts much like a vegetable steamer, or the steamer baskets used in dim sum. 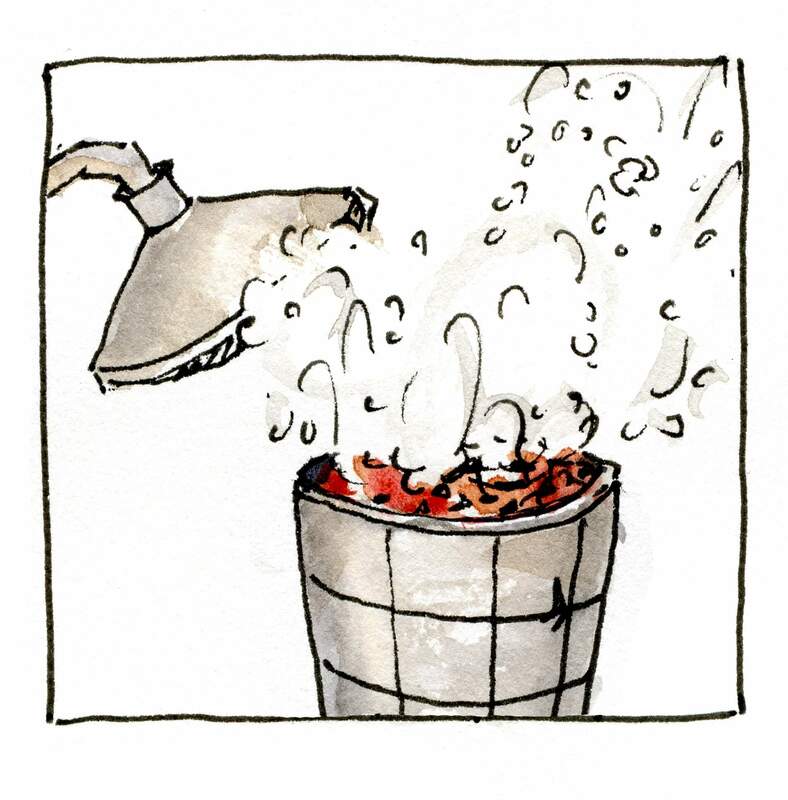 The pot is placed over a boiling cauldron of water, from which the steam rises into and cooks the grains. 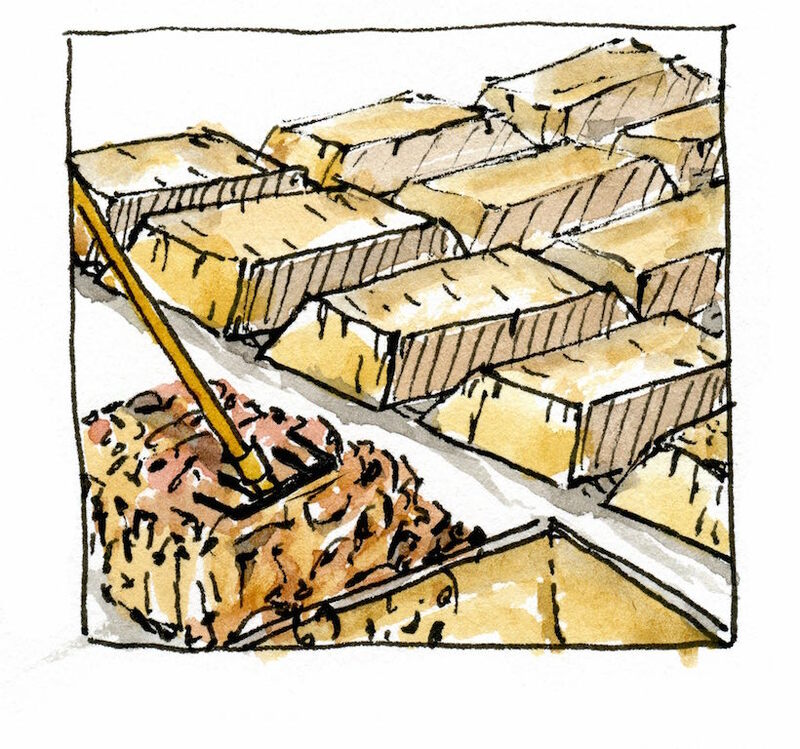 After steaming the temperature of the grain is too warm for yeast to survive, so the grain is carefully unloaded and raked onto a flat surface to cool. What: On paper fermentation is a simple process: sugar + yeast = CO2 + ethanol. The quest for ethanol—drinking alcohol—is old as time itself, and humans have performed it on all manner of substances around the globe. Combining yeast with naturally sugary ingredients is easy. 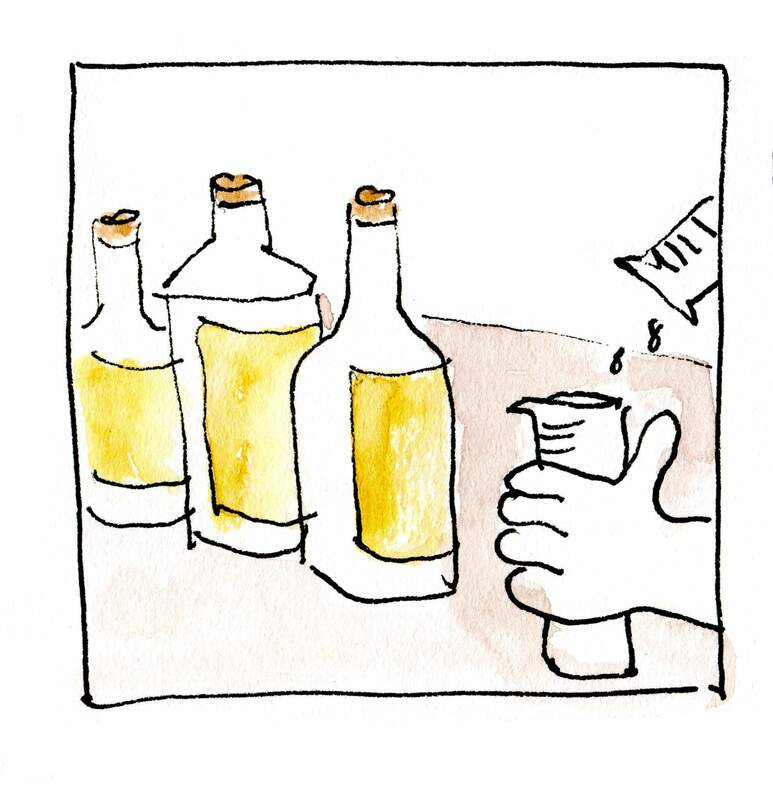 Honey and yeast combine to make mead, and fruit and yeast give us wine. Coaxing ethanol out of grains is trickier. Grains are rich in starch and low in sugar, so one must first convert a grains starch to sugar, a process called saccharification. Most of the world’s brewers malt grains then soak them in water to create a sugary broth called wort. Yeast is added to the wort, and the fermented result is an ale or beer. The genius of Chinese alcohol is the use of naturally harvested yeast microbial called qu. Qu converts starch to sugar and sugar to alcohol at the same time. This means that Chinese grain alcohol is both more potent and flavorful than their Western counterparts. How: After steaming the grains, workers sprinkle pulverized qu on top. The mixture is raked into a pile and shoveled into a traditional fermentation vessel, usually a subterranean pit or a stone jar. The vessel is sealed and the grains are left to ferment for a period usually lasting at least a month, becoming a fermented solid called the mash. The mash enters the vessel slightly under room temperature but can reach temperatures as high as 95°F (35°C) during fermentation. The longer the grains ferment the more esters form within the mash, which gives the resulting spirit a fruitier flavor. 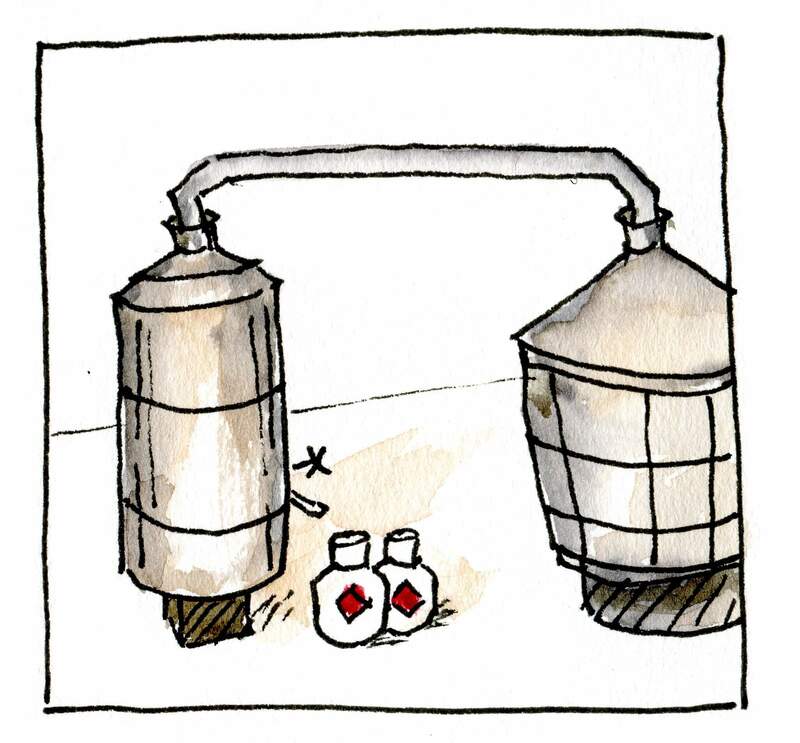 What: Distillation is the process through which one extracts the essence—or spirit—of a fermented substance. Typically this is done with a device called a still that heats an alcoholic compound until it begins to vaporize. Because the boiling temperature of ethanol is lower than that of water, the first part of the substance that turns to steam will have substantially higher concentrations of alcohol than what follows. A distiller captures the boozy vapors in the still and funnels them into a cooling chamber called a condenser, where the vapor will revert to liquid form. The liquid collected at the end of this process is a liquor, a beverage of substantially higher alcohol levels than that with which one started. Baijiu distillers put their own wrinkle on the process. Whereas most spirits are distilled from a liquid mash, baijiu is always distilled from a solid or semi-solid form. How: Distillers remove the fermented grain mash from the fermentation vessel and load it into a traditional Chinese pot still. Loading the still is a painstaking process of slowly sprinkling the mash around the still to avoid clumping. If the mash is packed in too tightly, the heat will not distribute evenly. The loaded pot is again placed over a boiling cauldron, and once the vapor begins to peel off the top of the mash the pot’s lid is sealed. The vapor travels through a tube from the pot into the condenser, where it coils through a chamber filled with cold water and emerges from a spout. The first baijiu to emerge from the still, the head, contains high levels of toxins, so it is discarded. The last portion of distillate, the tail, is similarly discarded. Only the purest ethanol, the heart, is reserved. Because Chinese fermentation vessels often contain more mash than can be loaded into a pot still, distillation is often done in batches. The quality and character of each batch varies greatly, so the distillate from each is stored separately. Nerd Out: Typically Chinese spirits are produced with a single distillation. Though this would generally result in relatively low alcohol levels, the solid mash adds a secondary level of distillation. Functioning similarly a column still, the alcohol vapors continuously condenses and redistills as they travel up the mash. This makes it possible for single-distilled baijiu to reach strengths upwards of 70% alcohol by volume. What: A freshly distilled spirit is drinkable, but patience is the more prudent course. Whereas Western distillers often age their products in wooden casks to impart oaky flavors, baijiu aging is done mainly to alter the chemical composition of the distillate. Young liquors contain higher levels of aldehydes, a fiery chemical compound that claws at the larynx and makes for an altogether unpleasant sip. By letting a distillate sit for a period and interact with its surroundings, oxidization will break down aldehydes and gives the beverage a mellower character. How: Baijiu distillates are always aged separately for a period of no less than a month, usually at least three months, and sometimes years. 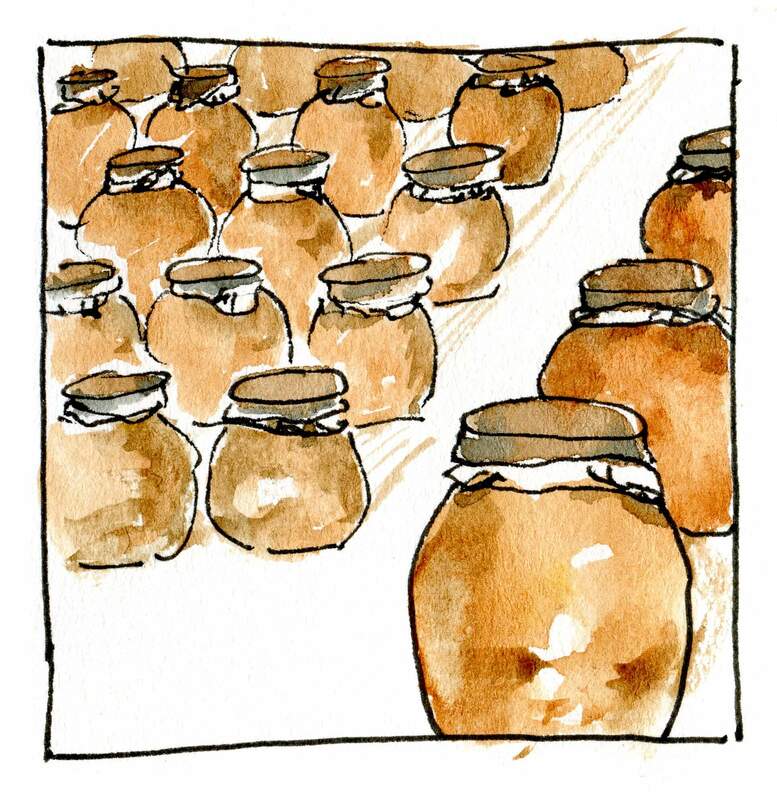 The most common aging vessels in China are terracotta jars and, for lower-end products, stainless steel tanks. The clay imparts light minerality, but the primary reason it is used is because it is highly porous and allows the distillate to better interact with its environment. Often the aging containers are stored in musty cellars or natural caverns, where the cool dank air limits the amount of baijiu lost to evaporation. What: All baijiu is blended, and the master blender is the most revered member of a baijiu distilling team. Her role is to balance the flavor profiles of various batches of spirits to achieve a concoction that best captures the brand’s signature style. Consistency, ingenuity and above all good taste are critical. How: When a spirit reaches the proper level of maturation, the master blender will assess its character and flavor. She then works to create a blend with the right flavor and complexity. Sometimes blenders use hundreds of unique distillates to create a single baijiu. As raw baijiu often contains alcohol levels well exceeding that at which it will be bottled, a blender is also tasked with using filtered water to dilute the product to the desired strength.